...Honeywell for GX Aviation services. Under the terms of the agreement, Honeywell will partner with Inmarsat to bring the benefits of GX to the business aviation market. 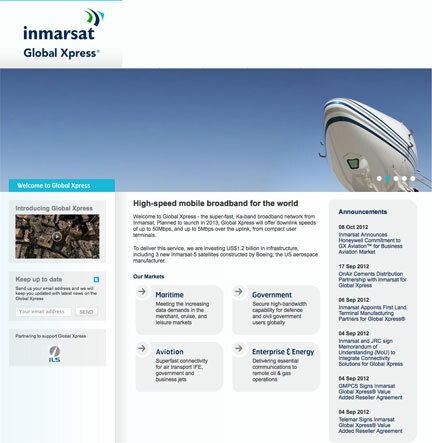 The Inmarsat Global Xpress satellite system is scheduled for global commercial service launch in late 2014, with service introduction for business aviation customers available in Q1 2015. The Ka-band satellite network will offer unprecedented data rates of up to 50Mbps to the cabin and global coverage, all backed by Inmarsat’s quality standards of reliability and performance. The signing of this agreement with Honeywell represents a strong endorsement of Inmarsat’s GX service innovation for the business aviation sector, and is underscored by Honeywell’s commitment to purchase GX capacity for five years and reserve capacity up to 2021. ...Inmarsat to deliver advanced services, from applications to business collaboration and video to multimedia content over Inmarsat’s new high-throughput satellite broadband network, Global Xpress (GX). Cisco will provide Inmarsat with a state-of-the-art satellite applications service delivery platform and a high performance access network for Inmarsat’s Global Xpress programme, the first global Ka-band (the satellite transmission frequency) network with mobile connectivity. Cisco will also develop a router for satellite network end-users that will utilise not only the Inmarsat GX capabilities but also the current BGAN global network. Cisco will build and operate the network on a fully managed basis before transferring it to Inmarsat, and will use its key software stacks of Service Delivery Platform and Prime to enable advanced capabilities such as voice, video, cloud application services and high speed Internet access. This GX/BGAN integrated platform will allow Inmarsat and its partners to rapidly develop and remotely deploy innovative applications to this new device and will extend the reach of new services across the whole Inmarsat network. Inmarsat will become a Global Partner for Cisco and the companies will bring their combined service capabilities to Inmarsat’s value added resellers around the globe. Scheduled for service introduction in 2014, the service delivery platform and satellite network router will leverage Global Xpress and BGAN offering unprecedented data rates and bandwidth, backed by Inmarsat’s quality standards, performance and global reach and providing the same experience as terrestrial broadband. It will be the only hybrid Ka- and L-band network designed to provide consistent global coverage.